A Facebook “Profile” (soon to be called a “timeline”) has a first and last name, and can send and receive “Friend” requests. A Facebook “Page” (formerly called a “fan page”) has a business (or organization) name, and other Facebook users can “Like” it. We’ve all seen it… you log into Facebook and you have a friend request from someone whose first name is “Bob’s” and whose last name is “AutoRepair.” Maybe you did it… you have a personal Facebook account and you’re trying to use it for business purposes. First, you should only do this if you have a Facebook “profile” (see above) that is really & truly for a business or organization (or public figure — more on that later) rather than for an individual. But you should do it if that’s the case… and you should do it immediately! Why? Because Facebook will delete the account without warning. It is a violation of the Facebook Terms. And Facebook isn’t obligated to give you any advance notice… when they discover the account (and they will) or it gets reported (think competitors here), it’s all over. All those relationships you built… all the hours you spent sending and responding to friend requests… all the time you’ve spent adding links, posting photos, sharing content, writing notes, commenting on others’ posts, etc… all gone. To my knowledge, no one has ever successfully appealed the deletion of a Facebook account. You simply get to start over… from scratch. Now… just because you’ve gotten away with it for a while doesn’t mean anything. Most of the business owners I run into stumbled into this situation quite by accident or without knowledge. And so you may not have realized you were violating the terms (you did read those, right?). And so many businesses got away with this for so long that they felt no need to do anything about it when they discovered the problem. But Facebook has been improving their detection tools, and their ability to discover fraudulent “profiles” has improved dramatically. 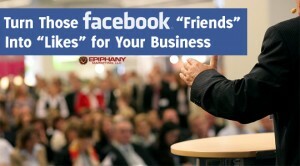 Previously, your only option was to create a Facebook “page” for your business, and then invite the “friends” of your “profile” to “become a fan” or “like” the new page. This was time-consuming, tedious, and not always very successful. Some people would “like” the new page right away… others would be confused… it was bad. You follow the link to the migration tool, which works almost identically to the “Create a Page” function. This means you need to choose what type of page you’re creating, complete all the necessary details, etc. Facebook migrates your “profile photo” and all your “friends” to the new page. The “friends” become people who have “liked” your new page. Your “profile” and all its other content (past posts, messages, admin privileges for other pages and groups, etc.) gets deleted permanently. You continue to login to Facebook with the same email address and password. Obviously, you’ll want to proceed with caution. While it’s great news that you get to keep those “friends” (as “likes”), you don’t want to accidentally lock yourself out of other pages or otherwise lose important stuff related to your Facebook account. Set up a new Facebook “profile” (if you don’t already have one) for yourself personally. If you already have one, make sure you can successfully log in to it! Add your new/other Facebook “profile” as an admin on any Facebook “pages” or “groups” that you have either created or have admin privileges for. If you don’t do this, you will permanently lose access to these pages and/or groups! Download a file from Facebook containing all the information from the “profile” you are migrating to a “page.” This way, all your old messages and any other content you’ve uploaded, shared or otherwise created on Facebook will be backed up to your computer before it gets permanently deleted from Facebook. Once you’ve done the above, then you begin the migration process with the Facebook migration tool. Proceed with caution: Facebook has an “appeal” process for people who perform this step accidentally and then wish to reverse it. But I wouldn’t bank on that actually working. Feel free to post your questions here (below). Additionally, Facebook has created some helpful resources about migrating your “profile” to a “page” that are worth checking out. For Public Figures: Authors, Speakers, TV Personalities, etc. Building a Large Following Associated with your Personal Name? 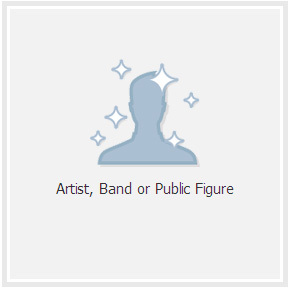 Create a Public Figure Page on Facebook. Occasionally when I speak about social media strategies for business, we have someone in the audience who has hit the 5,000 “friend” limit on Facebook. We also occasionally do consulting for authors, speakers, television personalities and others who have large followings who have had this happen or are well on their way. This allows you to maintain a “private” personal Facebook profile with a smaller number of “friends” with whom you can share personally, interact, etc., while maintaining a distinct persona from the “public-facing” version of your social media self. You will not hit the 5,000 “friend” maximum. Brands on Facebook are carrying tens of millions of “likes” without being capped. This means you can keep growing your following without limitations. Facebook actually becomes more useful and meaningful when it isn’t cluttered with posts from people you don’t really know very well. If you do maintain both, there’s no reason why you can’t use both to promote your new stuff… but just keep in mind some people will choose to “unfriend” or “unlike” one version or the other of you on Facebook (maybe both) if they’re seeing too much content from you. This is normal. But of course… if you’re delivering great value on Facebook, this won’t be concern! Want to learn more? We’ve created the Ultimate Small Business Growth Kit to help equip business people like you with winning strategies for growing your business in the 21st Century. Check it out today!